Conformable stripping pads are designed for uneven floors strips before refinishing. They quickly and easily cut through old finish. Super heavy duty scrubbing removes all finish, sealer and contaminants from the floor surface for two to four coat removal before re coating. 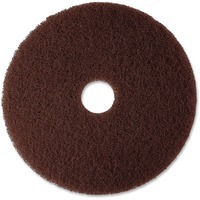 Uniform distribution of mineral abrasives throughout pad not just on the surface offers impressive performance and a long, useful life. Individually separated and coated fibers help produce more consistent results. Use for wet or dry stripping with rotary or automatic machine speeds of 175 to 600 RPM.